A brief history of Raymond’s working days and then a detailed and fascinating account of all the various processes involved in the re-building. 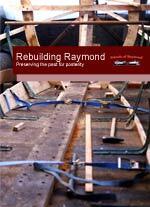 Please add £2 p&p and make your cheque payable to “The Friends of Raymond”, allow 28 days for delivery. All the money goes to The Friends of Raymond.